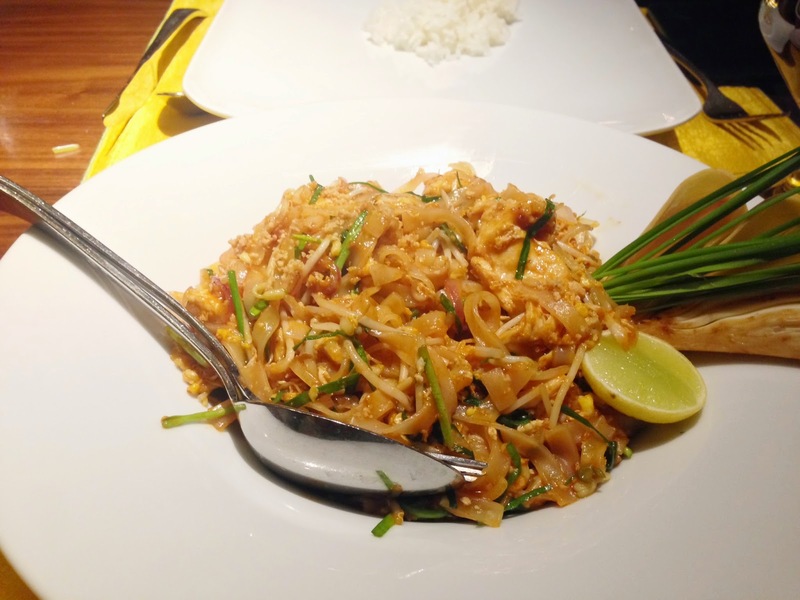 Finally Delhi - Say Sawdee to Some Good Thai ! 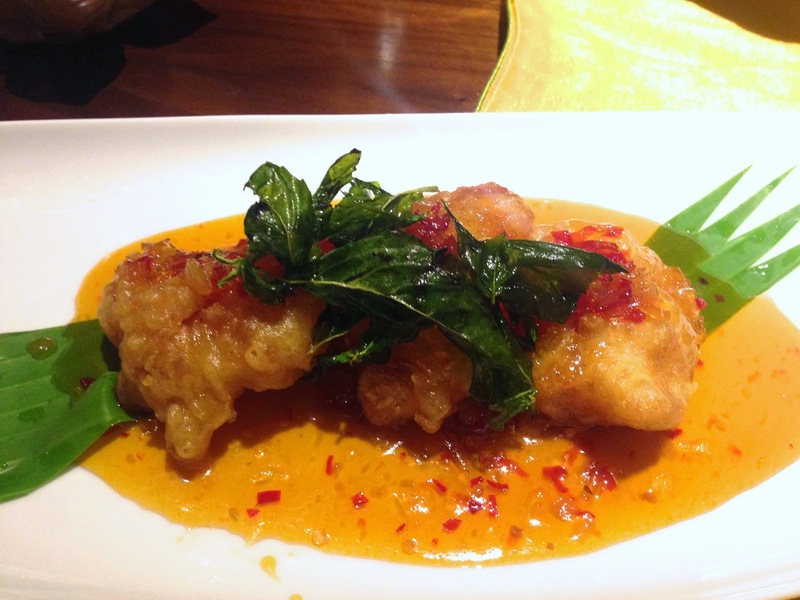 After Ban Thai closed down, Delhi was left with a serious void for a Thai restaurant. I am not sure If I ever thought all that much of it, but at least we had something that went beyond a few speckles of adulterated pad thai and colourful curries that numerous "multi-cuisine" or "pan-asian"restaurants offered. It always baffles me how a cuisine so close to our palate; almost unanimously loved by all here, is represented so negligibly. Anyway, enough of mourning something we can finally celebrate, the arrival of good, authentic Thai food, at Neung Roi. Of course there is a catch, there always is don't fool yourself; it is tucked away not so conveniently at Radisson Blu, yup all the way by the airport. But don't let that deter you for too long because I'm not entirely sure how long their wonderful Thai Chef Yenjai Suthiwaja, is there for. So chop, chop! Like most places it seems, there were some hits and some misses. It by no means was a flawless meal, but what was reassuring was that the things that worked, worked really well. With an extensive menu divided in to regional Thai cuisine, I am sure with a little bit of trial and error my next meal has the potential to be an all round success. 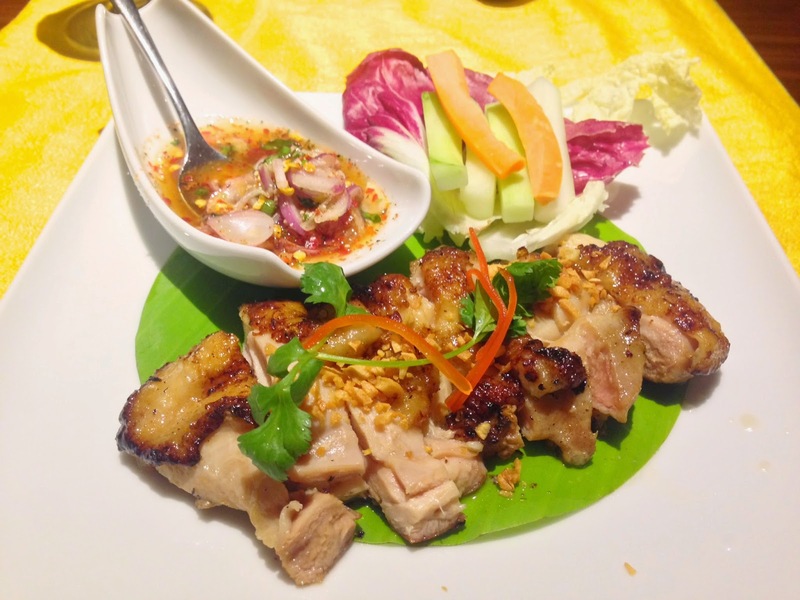 And let's face it, it is still miles ahead of any of that diluted Thai you are bound to try around town. What they could work on however is the ambiance. Surprisingly, outdated tackiness for a place as new as this. And the odd plastic floors squeak with every footstep, almost causing one to tip-toe as if guilty. 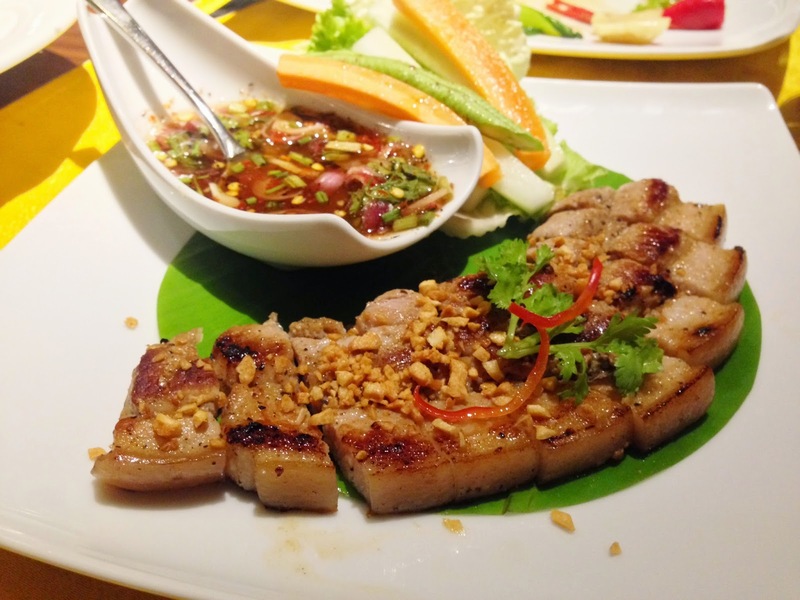 Overall, the drab and dark setting don't make it an ideal choice for a day of leisurely dining - so you are going solely for the love of Thai food. Tom Yum Pla - It wasn't all together a right-off, but it lacked that oomph a good fiery tom yum should have. 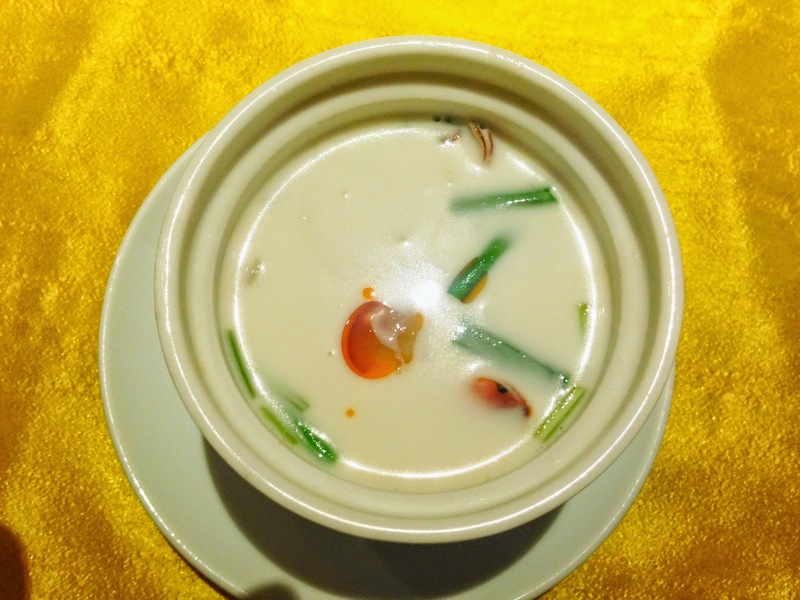 Tom Kha Goong - There are two kinds of people - team Tom-Yum or team Tom-Kha. A bit like the sweet corn vs. hot & sour divide? I for one love a good Tom-Kha, that creamy coconut milk infused with galangal gets me every time. This one was more coconut milk than anything else but I'll give it another shot. 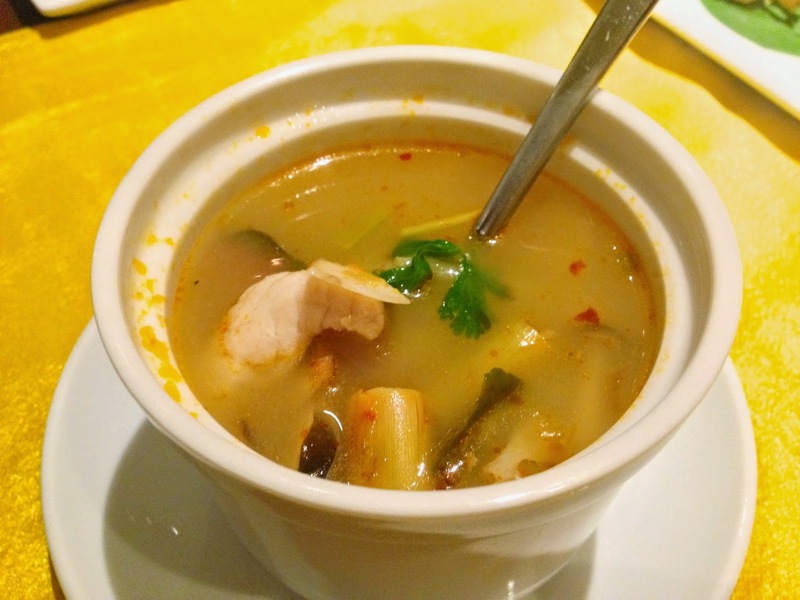 Tom Pok Teak - If a soup you must eat, this wonderful seafood soup should be it. Gai Yang - Succulent, juicy grilled chicken, with the skin thankfully kept in tact for oh-so much more flavour. 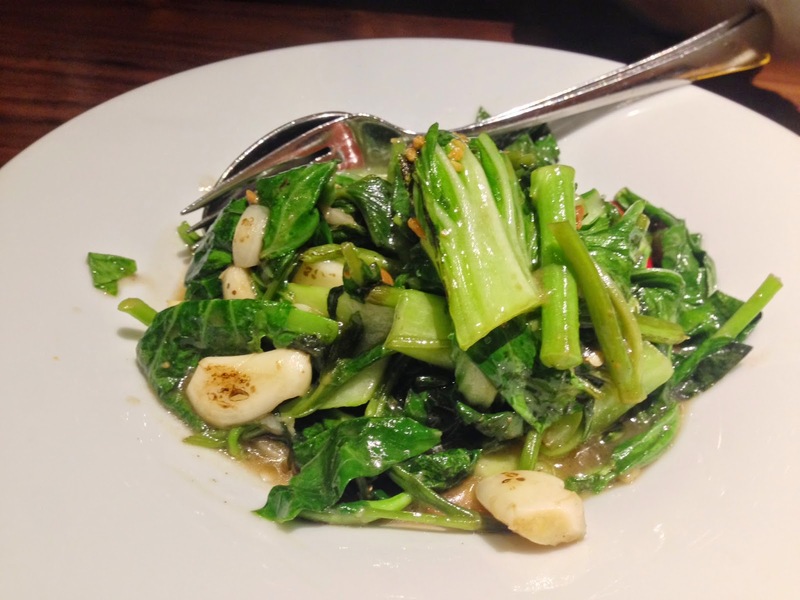 Topped with crispy garlic, and served with a zesty roasted chilli sauce. A must order indeed. Moo Yang - Same as above but with pork. Now normally according to men, everything tastes a lot better with pork than chicken but not in this case. For starters it lacked that juiciness the chicken had. This was the second pork dish I tried that I wasn't happy with, so my conclusion is that the quality of their pork just isn't that great . Both dishes the pork was chewy, dry and quite the workout for your pearly whites. Skip in my opinion. 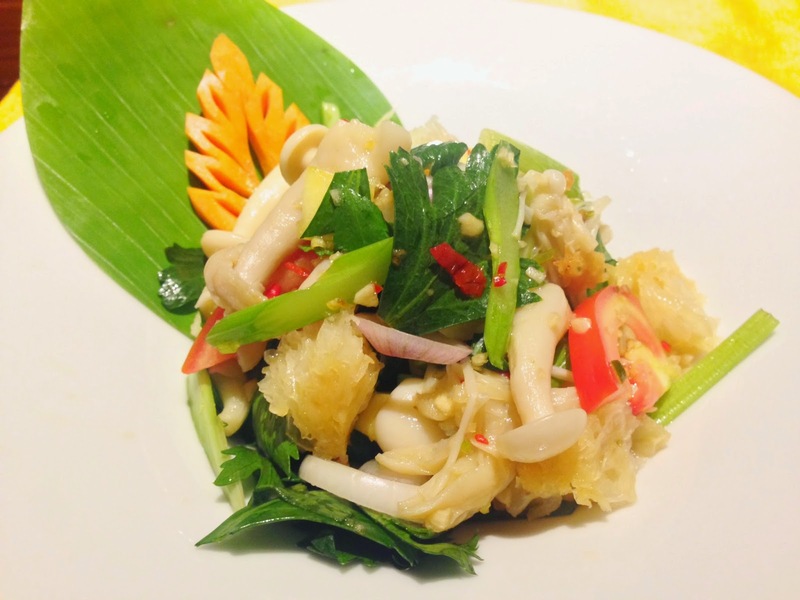 Yam Som-O - This pomelo salad was probably my favourite dish of the meal. 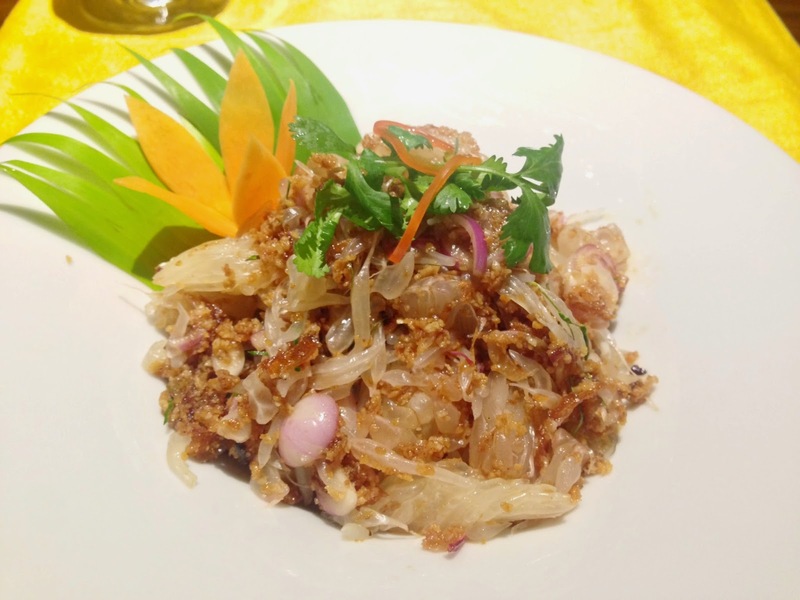 A beautiful juggling of flavours - fresh pomelo, crispy onion & garlic, sweetness from the palm sugar, a lovely tanginess from the tamarind dressing. Whole heartedly approved. Yam Hed Keaw - I love mushrooms. All sorts of mushrooms. But there is an additional textural appeal in chewing on white cloud fungus. It feels almost like cartilage, making it a borderline carnivorous experience. Now if I haven't freaked you out entirely, my point was that this is another great salad to try if you love your mushrooms. Pla San Rod - Not a complete write-off but I wouldn't order it again. For one the thick batter over-powered the fish. And it did fail to inspire a second serving, let alone a second order. Fish in Lime & Chilli - This version of fish however was a delight. 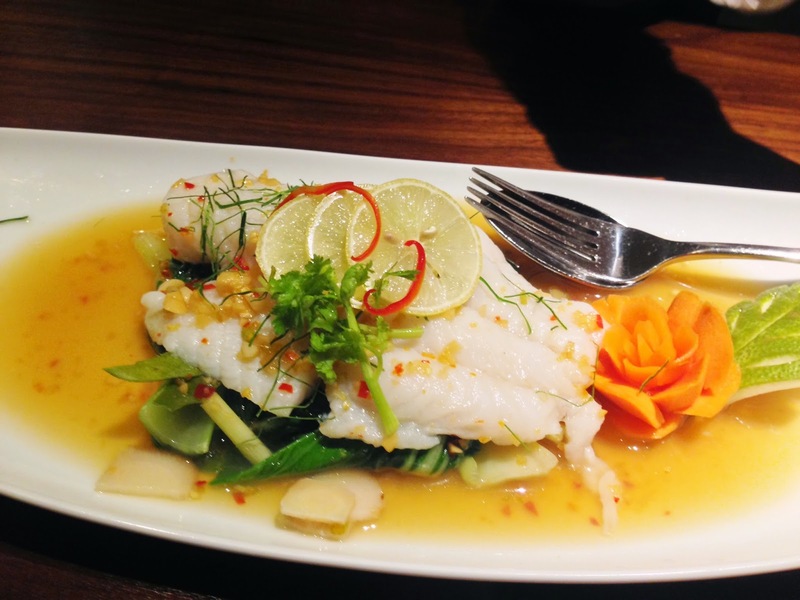 Fish so meticulously cooked to just the point of turning opaque, made it ever so light. Bursting with flavours of fresh herbs and aromatic. And the lime enforced two ways with juice and its aromatic leaves. A must. 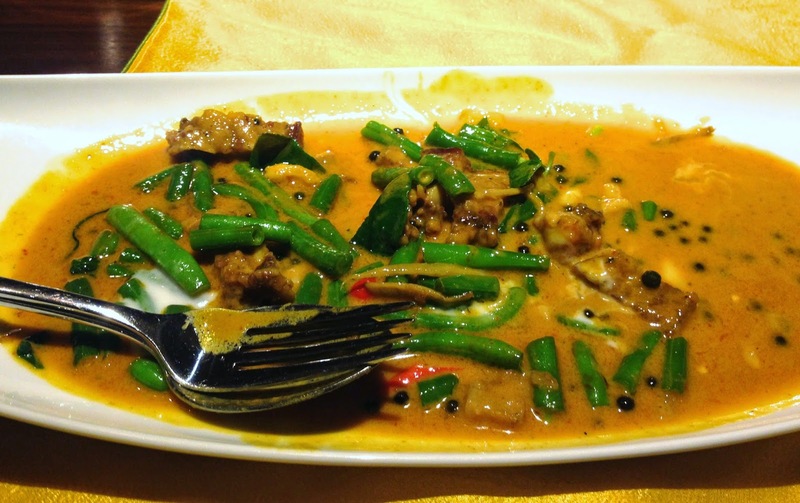 Phad Ped Moo Krop - Pork, crunchy beans in a thick coconut yellow curry. Though the pork bits could have been better, it was a lovely dish, best eaten over steamed rice. I would also ask them to go easy on the salt second time around. 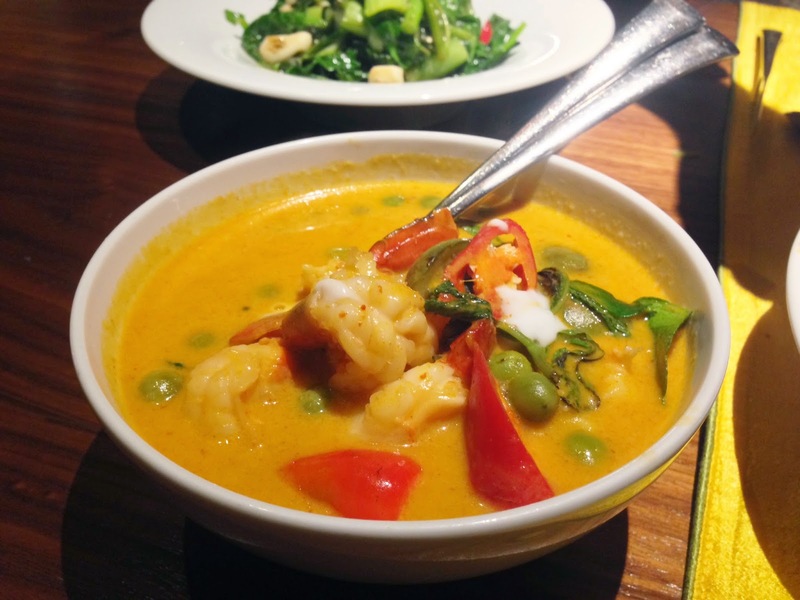 Prawn Red Curry - Prawn red curry isn't on the menu though some variation of red curry is. Judging from the nonchalance of our server as this adaptation was noted, they don't have a problem changing proteins for the curries. You can probably find red & green curry on just about every menu in the city, and it is brutally bastardised by most. But Neung Roi reminds you how it's done. Thank you for this delicious curry. Phad Pak Kana - Kale w/ Light Soya Sauce, Garlic & Chilli - Always a great start when you aren't met with a stodgy, corn-flour laden sauce! Crunchy greens, allowed to shine without much interruption from sauces and seasonings - soya and garlic let the kale shine. Do try. Stir- Fried Veggie Noodles - I don't know how this got to our table, or who ordered it, especially when the entire time I craved a bowl of Pad See Ew ! Was there anything wrong with it? Not really. Should you order it ? Of course not. Why? It couldn't get any more boring than this and there are many interesting noodle dishes on the menu to try from. Phad Thai - Still haven't made it to the pad see ew, but the pad thai was certainly not a regret. The flavours were right on the ball, a tango of salty, sweet, and just plain tasty. My only complaint was I wouldn't have minded a little more crunch and freshness from the sprouts and chives. 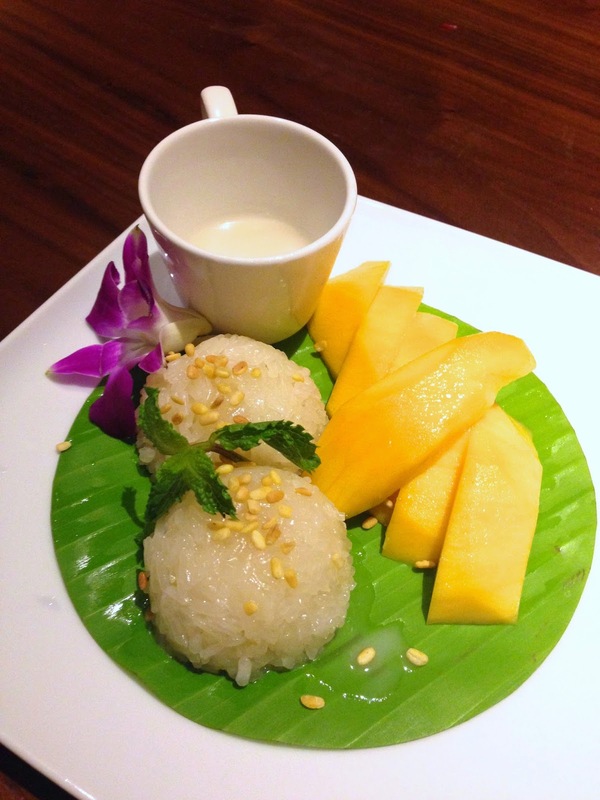 Kha Niew Mamuang - Sticky Rice w/Mango & Coconut cream - I don't think I should comment on this much because this combination of mush and more mush has never sat well with me. But judging from everyone else's faces I presume it was alright. What I wanted wasn't available that day, but it is one of my all time favourites, Saku Melon (as known on their menu); which is a light coconut milk with sago and melon. There couldn't be a more refreshing dessert on a hot summer's day. 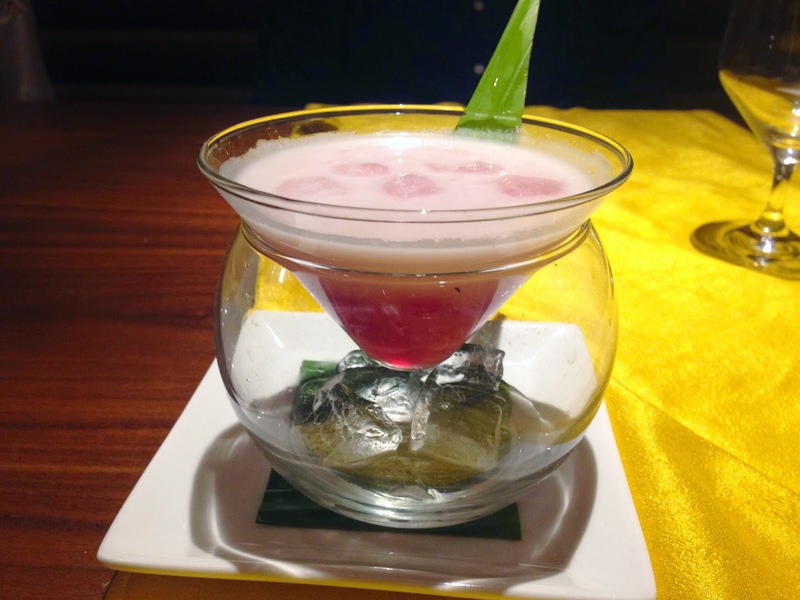 Tub Tim Krob - Water Chestnut in Coconut Jasmine Syrup. I love water chestnuts in my dessert, and that was primarily the reason for ordering this. Don't let that frightening pink colour put you off, for it did deter me a little. This is light, refreshing, and just the right kind of "scented".